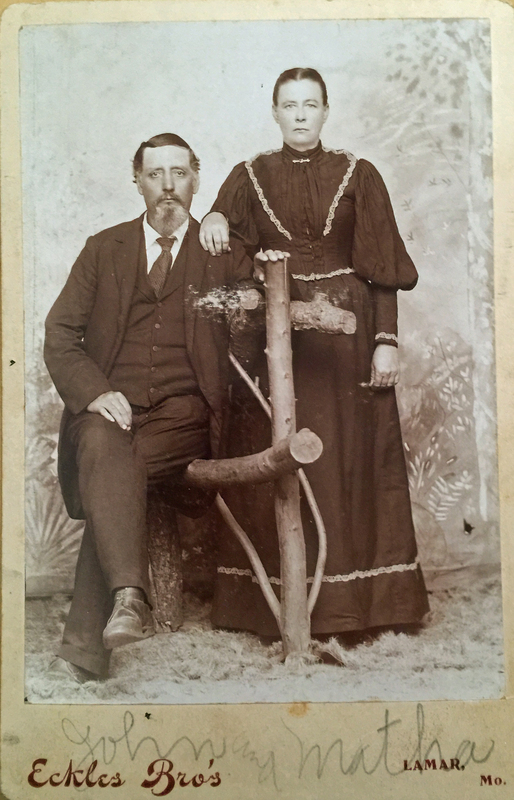 Samuel Montgomery and Phoebe Elizabeth Pruitt are Todd’s 3X Great Grandparents. Todd’s mother Marilyn is in the DNA Circles at Ancestry.com for Samuel and Phoebe, plus both of Phoebe’s parents and both of Samuel’s parents. Samuel Montgomery was born on November 24, 1824 in Gibson County, Indiana. His parents were Robert Montgomery and Patience Marvel. Read about them here. Phoebe Elizabeth Pruitt was born on August 20, 1820 in Vanderburgh County, Indiana. Her parents were Moses B. Pruitt, Jr. and Phoebe Williams. Read about them here. 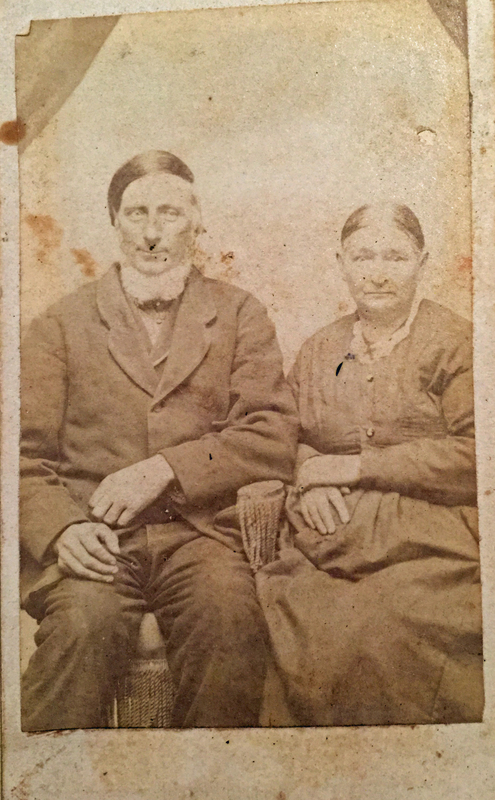 Samuel and Elizabeth married on December 12, 1844 in Vanderburgh County, Indiana. On the 1850 US Census, Samuel and Elizabeth were both listed as being 28 years old. They lived in Armstrong, Vanderburgh County, Indiana and had 4 children: Martha, age 4; John, age 3; James, age 2; and Joseph, an infant. Also in the home was Elizabeth’s mother Phoebe Pruitt, age 66. Elizabeth’s brother Simon lived on one side, and her brother John lived on the other. Brother William was close by. On the 1855 Illinois Census, the family was listed in Township 20, Logan County. The household included 4 males under age 10 (John, age 8; James, age 7; Joseph, age 5; Simon, age 2) ; 1 male aged 30-40 (Samuel was 31); 2 females under age 10 (Martha was 10 and Mary was 1) ; 1 female aged 30-40 (Elizabeth was 35). One person was in the militia. The value of their live stock was $445 and they had 90 pounds of wool. On the 1860 US Census, the family was in Lincoln, Logan County, Illinois. Samuel was said to be 31, and Elizabeth was said to be 39. They had 8 children: Martha, age 14; John, age 12; James, age 11; Joseph, age 9; Simon, age 7; Mary, age 5; Absolom, age 3; Phoebe, age 1. (Daughter Patience Comfort had been born and died since the last census. I believe there should be a son, Samuel Jr., listed too. He would have been 6 months old and died a year later.) Also living in the home was James Check, age 21. It is indicated that neither Samuel nor Elizabeth could read or write. On the 1870 US Census, the family lived in Oran, Logan County, Illinois. Samuel was 46 and Elizabeth was 50. They had 5 children at home: Joseph, age 20; Simon, age 17; Mary, age 14; Absolom, age 13; Elizabeth, age 12. On the 1880 US Census, the family remained in Oran, Logan County, Illinois. Samuel was 57 and Elizabeth was 61. Two children were at home: Absolom, age 23; and Pheobe, age 21. Also in the home was Clark Gardner, a 23 year old servant working on the farm. Elizabeth died on October 8, 1881 in Cynthiana, Posey County, Indiana. She was visiting her sister and brother, became ill and died there. Her Find A Grave memorial is here. Samuel died on January 24, 1897 in Beason, Logan County, Illinois. Martha Ann Montgomery – Martha was born November 23, 1845 in Posey County, Indiana. She married John Harmon, a farmer and carpenter, and they had 7 children. Martha died in 1926 in Beason, Logan County, Illinois. Her Find A Grave memorial is here. John William Montgomery – John was born in 1847 or 1848 in Posey County, Indiana. He married Martha Victoria Franklin. They farmed and had 8 children. John died May 10, 1921 in Assumption, Christian County, Illinois. His Find A Grave memorial is here. James Thomas Montgomery – James was born March 15, 1849 in Indiana according to his Illinois death records. He married Juliett A. Mounts on April 8, 1877 in Gibson County, Indiana. They had at least 2 children. On the 1920 US Census James was a 69 year old widower living in a hotel in Lincoln, Logan County, Illinois. He worked as a watchman at a casket factory. He died November 8, 1922 in Lincoln, Logan County, Illinois. Joseph Franklin Montgomery – Joseph was born in 1850 or 1851 in Indiana. The only records I have of him as an adult are 3 marriage records and one census. He married Martha Gasaway on August 17, 1873 in Logan County, Illinois. They are on the 1880 US Census with 2 children. He married Anna Ingram on March 28, 1891 in Logan County, Illinois. He married Mary Schafer on December 27, 1896 in Logan County, Illinois. Simon Wesley Montgomery – Simon was born May 15, 1853. 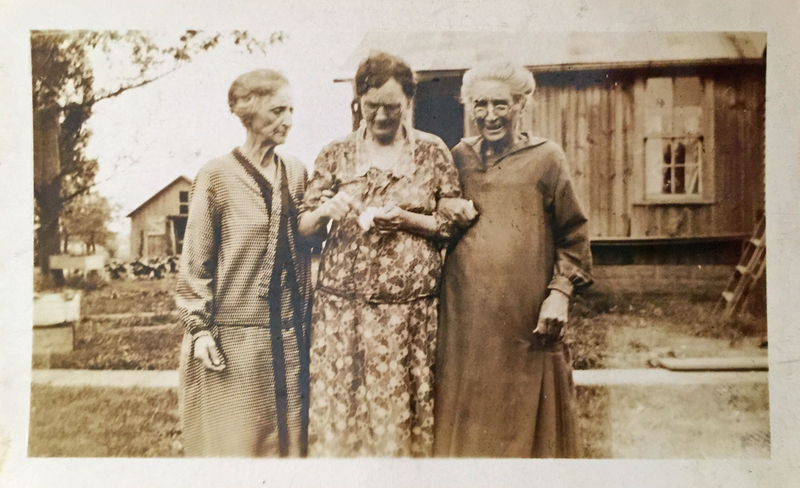 He married Emeritta E. Eaton (pictured in middle, above). They had 6 children. Simon worked as a farmer, and on the railroad. Simon died on December 9, 1931. His Find A Grave memorial is here. 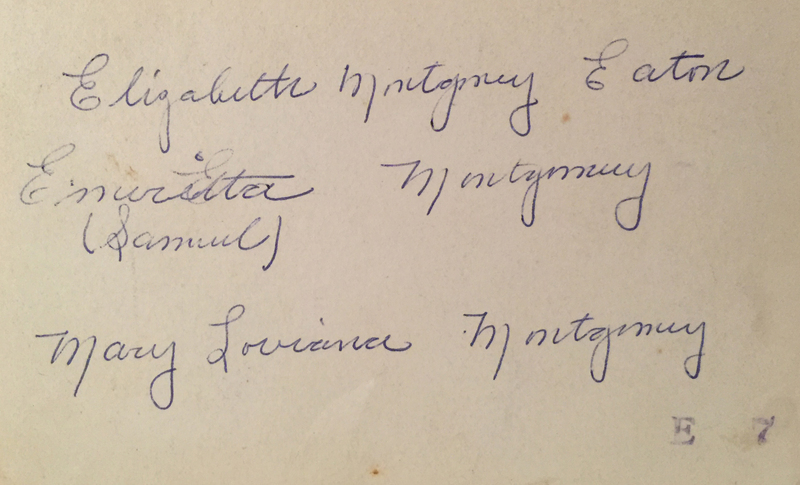 Mary Lavina Montgomery – Mary is Todd’s 2X Great Grandmother. (Pictured on right, above.) Read about her here. Don’t miss the 4-part series of photos belonging to her, starting here. Absolom Jasper Montgomery – Absolom was born January 15, 1856. He didn’t marry. He died January 2, 1882 after being struck by lightening. His Find A Grave memorial is here. Patience Comfort Montgomery – Patience is said to have been born on April 11, 1857 in Beason, Logan County, Illinois. She is said to have died on October 12, 1857. Phoebe Elizabeth Montgomery – Phoebe was born April 26, 1859 in Logan County, Illinois. She married George Henry Eaton and they had 3 children. (She’s pictured on left, above.) Phoebe died March 16, 1942 in Logan County, Illinois. Her Find A Grave memorial is here. Samuel Montgomery Jr. – Samuel is said to have been born on January 3, 1860 in Beason, Logan County, Illinois. He is said to have died on July 19, 1861. 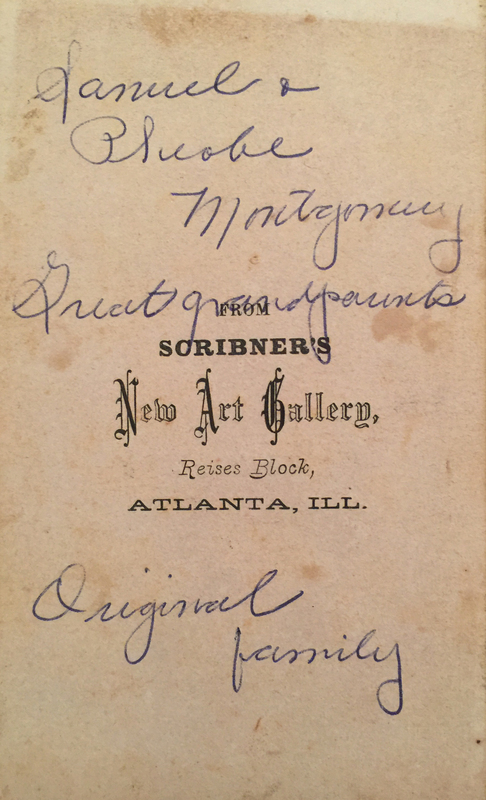 This entry was posted in Reece Family History and tagged Absolom Jasper Montgomery, Anna Ingram Montgomery, Clark Gardner, Emeritta E. Eaton Montgomery, George Henry Eaton, James Check, James Thomas Montgomery, John Harmon, John Montgomery, John William Montgomery, Joseph Franklin Montgomery, Juliett A. Mounts Montgomery, Martha Ann Montgomery Harmon, Martha Gasaway Montgomery, Martha Victoria Franklin Montgomery, Mary Lavina Montgomery, Mary Schafer Montgomery, Moses Pruitt, Patience Comfort Montgomery, Patience Marvel Montgomery, Phoebe Elizabeth Montgomery Eaton, Phoebe Elizabeth Pruitt Montgomery, Phoebe Williams Pruitt, Robert Montgomery, Samuel Montgomery, Samuel Montgomery Jr., Simon Montgomery, Simon Wesley Montgomery, William Montgomery by fillinginthefamilytree.com. Bookmark the permalink.